Excited about spring weather but not entirely sure how to spend it? San Luis Obispo County is particularly beautiful in Spring and offers many Central Coast attractions for all to enjoy! Below is our top ten list of things you must do during spring on the Central Coast. 10. Farmer’s Markets! Visit Pismo on Wednesday’s, San Luis on Thursday’s, Avila on Friday’s, and Paso Robles on Saturday’s AND Tuesday’s for local produce and shopping. You don’t want to miss out on the local goods! 9. Surfside Donuts! Indulge, and get yourself a sweet treat at Surfside. With their daily custom donut menu, there’s sure to be something that will surprise both you and your taste buds. Don’t wait until the last minute though, their donuts are known for going quickly. 8. Zip-lining! Adventure to Santa Margarita Ranch where you can soar across acres of vineyards. It’s a view you don’t want to miss and a thrill you’ll never forget. 7. Stand-Up Paddle Boarding! Visit Avila Beach Paddlesports where services include rentals, lessons, and eco-friendly Adventure Tours. Paddle boarding is a new way to experience the ocean, while testing your balancing skills. 6. Hiking! Montana de Oro is a California State Park with plenty of places to hike and enjoy the coastal breeze. Hazard’s Peak is a six mile total hike that offers a view spanning across Montana de Oro all the way to Morro Bay and perfect to do in spring time. On a clear day you can even see Morro Rock. 5. Horseback Riding! Have a love for horses and the beach? Pismo Beach offers horseback riding along the dunes for an hourly or day rate. With no tumble weeds or stage coaches to clutter up the trail, you can enjoy a gentle walk with the Pacific Ocean right at your feet. 4. Healthy Hunger! Kravabowl is a new locals hot spot in Avila Beach. Whether for breakfast or a late afternoon pick-me-up Kravabowl offers acai bowls with some of the most refreshing and nourishing ingredients including chia seeds, cacao, and goji berries. 3. Kayaking! Morro Bay offers plenty of shoreline shops to rent a kayak. 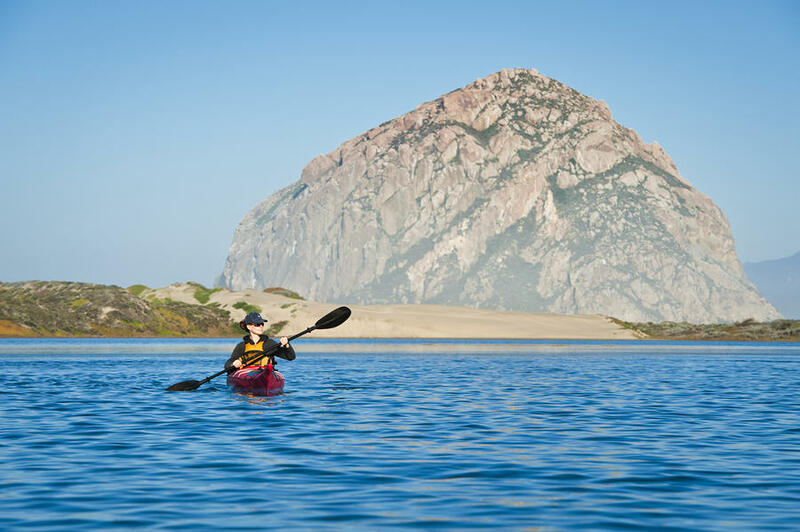 Whether you stay in the bay or venture around Morro Rock you can be sure to get a good workout and get a close up view of some sea otters and lions. 2. Wine Tasting in Paso! With over 40 wineries spanning across the town, there are plenty of wines to taste in Paso. Enjoy local wine and learn how each winery got to where they are today, because whether they’re from France like L’Aventure or have a love for Spanish culture like Wild Coyote you’ll be sure leave with a new span of knowledge. 1. Avila Valley Barn! On your way to Avila Beach you’ll pass Avila Valley Barn. Be sure to stop by and visit. Get up close with the farm animals and maybe even take a hay ride while you’re there!